• Mike D'Antoni will face his former team when the Knicks host the Suns on Tuesday night. Phoenix posted a 232-96 (.707) record during D'Antoni's four seasons as head coach, the third-best mark in the NBA during that time, behind the Mavericks and Spurs (both 236-92). 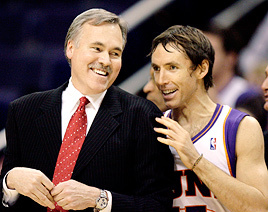 Incidentally, the Knicks have never won as many games over a four-year span as the Suns did under D'Antoni. New York's highest four-season win total was 223 (1991-1992 to 1994-1995). • Carmelo Anthony, whose Nuggets host the Warriors on Tuesday night, averaged 30.4 points per game during November. It was the second time Anthony averaged at least 30 points per game in November, having previously done so in November 2006 (31.5 ppg). The only other Nuggets player to do that even once was Alex English (31.3 in 1982, 30.2 in 1984 and 31.0 in 1985). • The Celtics, who visit the Bobcats on Tuesday night, defeated Charlotte 92-59 on opening night in Boston. Over the last six seasons, only two NBA teams have held an opponent below 60 points, and the Celtics have done it twice (104-59 against the Knicks in 2007). The other team was the Raptors, who beat the Heat 96-54 in March 2008. Steve Nash will take on his former coach, Mike D'Antoni, on Tuesday in New York. EAST RUTHERFORD, N.J. -- The Nets emptied their offices this morning and invited everyone downstairs to the practice court for Kiki Vandeweghe's introductory news conference as head coach -- a move that won't take effect until Thursday, leaving assistant coach Tom Barrise in the hot seat as the Nets tries to avoid an NBA-worst 0-18 start when they play host to the Dallas Mavericks on Wednesday night. When team president Rod Thorn introduced Vandeweghe, the team employees applauded. "You're clapping now, but..." Vandeweghe said with a sheepish smile. Like those front-office folk, Vandeweghe was attending the news conference because he had to. His ambition is to run his own NBA team from the front office -- not from the bench. Thorn, who noted that all three of the coaches he has hired in New Jersey -- the recently departed Lawrence Frank, Byron Scott and Vandeweghe -- had no prior NBA head-coaching experience, said he spoke to six people regarding the position. Note that he didn't say he interviewed six people, only that he spoke to six people, before informing Vandeweghe that the job was his. "Rod is a very persuasive guy, and much smarter than I am," Vandeweghe said. "I want to thank Rod for not necessarily making it my choice." Vandeweghe was asked: Did you ever want to be a coach? "Not until Rod called me yesterday," Vandeweghe said. "But it's a challenge, and you embrace the challenge. I'm sure all the coaches I've had are laughing at me right now." Vandeweghe will lean heavily on new lead assistant coach Del Harris, whose contract was still being worked on Tuesday and who will not join the team until later this week. Harris and Vandeweghe were assistant coaches together years ago in Dallas when Harris was Don Nelson's lead assistant and Vandeweghe focused on player development, spending long nights in the gym working on shooting drills with Steve Nash and Dirk Nowitzki.